Unparalleled customer support is one of many aspects that has set Newton Crouch Inc apart from our competitors. Our team is dedicated to ensuring that your equipment is running at its peak performance. In 1940, our customers could simply visit the shop for support. However today with NCI reaching global status, we have developed a more technical online approach to assisting our customers. Please browse through the list of Technical Tips. If you don’t find the answer or would like clarification, feel free to give us a call. NCI now has a YouTube Channel with “How To” videos. Give us a look! Newton Crouch Inc’s highly qualified maintenance representatives are there to help solve any problem you have. All three of our locations have staff knowledgeable in servicing your Newton Crouch equipment as well as equipment manufactured by our competitors. On top of routine maintenance, our Sebring and Albany locations specialize in rebuilding spinner motors and John Blue pumps. If you cannot make it into one of our three locations, click here to be contacted about in shop support. Newton Crouch prides itself on providing excellent customer service. Our unique on site support program can help you with a variety of questions. Initial setup of spreader. This is especially helpful when converting your farm to variable rate technology. Pre-season check up. Make sure your spreader is ready for a new growing season with this helpful service. Includes checking of hydraulic systems, conveyor, dishes, hull, and trailer. Spread pattern test. In summer rodeos held by our buyers, Newton Crouch spreaders consistently have the best spread pattern test! We want to make sure you get those same results. Program is based to fit your needs. Price is dependent of time and expenses. We suggest you get some of your friends and neighbors with Newton Crouch equipment together at one location. Newton Crouch offers training and technical assistance on all manufactured equipment and Precision components. NCI also sells parts for maintenance and repair on a wide variety of items on your equipment or business. 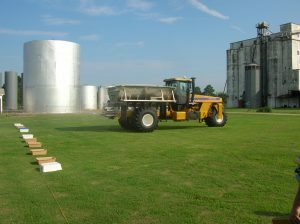 Your dry spreader or liquid sprayer was built to your specifications. An manual came with your equipment. This book contains valuable information about operating, maintaining or repairing your equipment. In the back of your book is a Delivery & Inspection Sheet. This document is information about the components and features that are specific to your unit. Every manufactured Newton Crouch equipment has a serial number welded or bolted onto the frame of the unit. NCI has a copy of Delivery & Inspection Sheets by serial number dating back to the early 1980’s. When ordering parts or for technical assistance, please have your serial number or Delivery and Inspection Sheet on hand. This number allows our technical staff to look up the original configuration of your equipment. This will help to ensure you get the correct parts since many items look similar but are, in fact, different. Call us at 1-800-241-1350 to speak with a real person—-no menus, no recorded messages. Newton Crouch Inc. is MADE IN AMERICA!